The grenades are shockingly loud. We went to the grenade range in Basic Training and as we filed in the bunker we were hearing these huge, ground trembling explosions, the walls and the floor just about shaking. These can’t be grenades – – too powerful, must be artillery shells or something. They better be. They weren’t. They were the grenades. 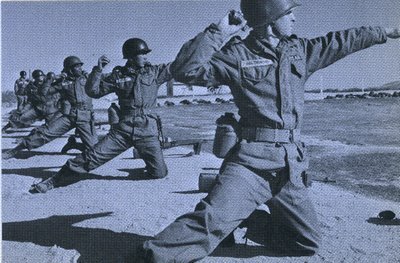 Our so tough drill sergeant was visibly shaking – – he had to take each young dumb clueless recruit out behind a horseshoe-shaped ring of waist high sand bags. The soldier would say, Preparing my grenade; then, Throwing my grenade, then, Grenade, as you threw it. Our arms (not yet tatted up, but very soon) were all up in the air pointing at 45 degrees like we were balletic visionaries. As most people know (but I didn’t back then, none of us knew anything), you pull the pin but as long as you don’t separate the attached lever from the body of the grenade nothing happens. As soon as you drop the lever the hand grenade starts to cook. I think they told us to hold it cooking in your hand for three seconds; when you throw it it explodes immediately – – no chance for the enemy to flee or throw the grenade back or away. At the end of Basic you are tested on a grenade course. Six stations have targets from 15 to 30 meters. You fail or you pass as either a Marksman, Sharpshooter or Expert. Grenades at Fort Leonard Wood; lights out at 9 pm and we fell asleep immediately.